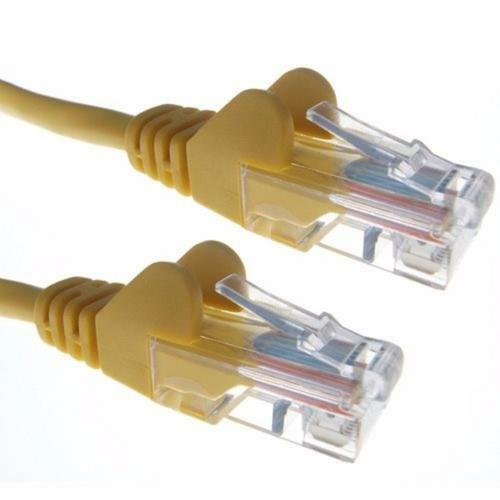 RJ45 Cat5e Network Cables can be used to connect any network enabled device such as a PC, Laptop, Printer, Scanner, BluRay Player or Games Console (Xbox 360, Xbox One, PS3 and PS4) into a Modem or Router to allow the transfer of data to and from the device. It has become increasingly popular for Businesses both small and large along with homeowners to use the internet to make calls, known as VOIP (Voice Over IP), these cables are ideal to connect these specific phones into the network. - Plastic is physically injected into the end of the connector to ensure that both the boot and connector are the same size, making it easier for multiple network cables to be connected into a patch panel. The design means that it is virtually impossible to break the RJ45 connector from the cable and ensures the cable is kept strong and robust. This cable comes with a Lifetime Warranty! These cables are ROHS and REACH Compliant. These are genuine Cat5e cables and therefore pass the renowned Fluke Test. We also stock a wide range of additional data accessories such as Network Switches, Patch Panel, Cat5e Couplers, Cat5e Outlets to suit this cable.